Many neuroimaging techniques are available for the study of the child and infant brain. These are designed to either detect direct activation related to electrical or magnetic activity in the brain (e.g. EEG or MEG) or the coupled hemodynamic response (e.g. PET, fMRI and fNIRS). While being very well established for adults, many of these techniques have limitations making their application to infants hard or even impossible. While some of them require the use of radioisotopes (PET), others, like MRI or MEG require the infant to remain very still. EEG allows for relatively fast setup time and is well tolerated by children & infants, however, the signal is highly-susceptible to motion or environmental artifacts. The general use of these techniques (i.e., EEG, MEG, PET, fMRI) with infant subjects in particular has been restricted to studies of sleeping or sedated subjects. Until recently, the field had lacked a safe, fully non-invasive and participant-friendly modality to comprehensively investigate the infant brain. fNIRS has filled this gap, opening up the means for new discoveries in infant and child research. The NIRx blunt-tipped optode is ­­ideal for neonatal and infant subjects. The NIRx patented dual-tipped optode is ­­ideal for subjects ages 1 – adult. A combined fNIRS/EEG NIRScap headgear used for infant monitoring. May be easily combined with other measurement techniques: eye-tracking, EEG, etc. fNIRS offers a safe, reliable, easy-to-use, and efficient tool to explore the infant and child brain. The degree of subject tolerance needed is extremely low, considering the modality's noninvasive and light-weight nature, as well as its fast setup and preparation times. 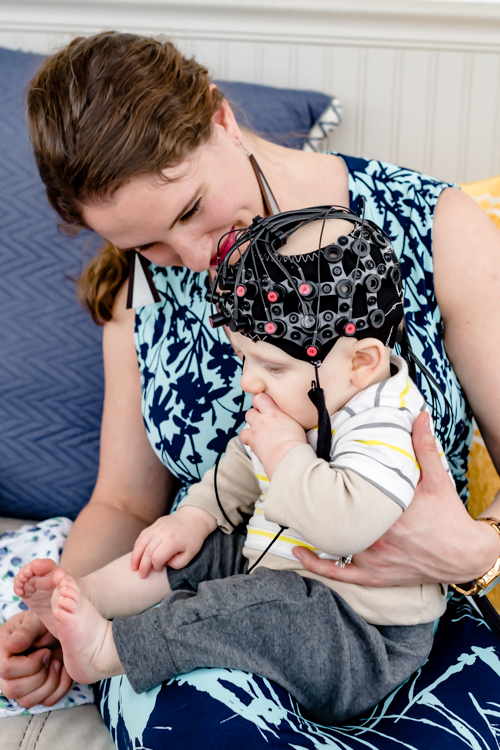 Since the pioneering studies of functional brain activation in infants, the number of published fNIRS infant and child studies has rapidly increased. fNIRS has been used to address topics such as speech perception and language development, social communication and interaction, object processing, human action processing, and developmental disorders. Although individual variation can never be excluded, this placement should ensure recording from perisylvian and anterior brain regions. The dashed white lines separate anterior and posterior ROIs. The red ellipses indicate the channels included in the frontal area of interest. The blue ellipses indicate channels included in the temporal area of interest. The results indicate greater hemodynamic responses to ABB sequences rather than ABC sequences in the bilateral temporal and left frontal areas. Prosodic cues are implemented in each language differently in such a way that there is always a dominant cue. fNIRS has been used to understand whether newborns are already able to discriminate prosodic variations. It is compelling to further investigate how bilingual newborns react to variations in prosodic cues which are dominant in one of their native languages but not in the other. Left: Fig. 2, Bottom Right: Prosody perception at birth [2, 3]. Study of the effect of variations in pitch, duration and intensity in the speech signal in monolingual and bilingual newborns. Gervain, Judit. "Plasticity in early language acquisition: the effects of prenatal and early childhood experience." Current opinion in neurobiology 35 (2015): 13-20. Bouchon, C., Nazzi, T., & Gervain, J. (2015). Hemispheric asymmetries in repetition enhancement and suppression effects in the newborn brain. PlosOne, in press.